I was out on the boat past midnight here! Last night's low was 46. We have had a tremendous amount of rain though. The lake is 3' above full pool and I was dodging logs left and right - which can be dangerous with no moon. Just to update it looks like a high of -11 at home here today...…………. No I'm not fishing. Glad to hear things are cooling off up in Alaska. 63 degrees here this morning at 7:30, that’s about the average high for these parts this time of year. Should climb to 73 later today. More seasonable highs in the 50s and 60s expected for tomorrow through next week. No serious frost here yet. My garden is loving the no extreme temperature swings, temperate weather. Getting lots of nice lettuce and cabbage family type of produce. The blood oranges have lots of blood in them with some November and December cool to near freezing temperatures. The gulf shelf water is a bit cooler than average and that helps the flounder spawn. We just need more sun to dry things out some and that’s the forecast for the next week. Planted snow peas Sunday and they should love the cool conditions if that pattern continues. We're just happy for that wood pile guys, the little stove is running hard and we're warm here. My other major hobby, besides piddling, has always been running. As a product of the Deep South, I love to run in the snow. It’s pretty rare where my main home is located. One afternoon up at my old place near Ft. Shaw MT it was snowing with a slight breeze. I set out on a 10 mile out and back. It was great on the way out. Fluffy snow, quiet, no traffic, etc. I made the turn and the “breeze” hit me. I arrive home with six inch snoticles and my hair frozen in spikes (I had gotten warm and taken off the beanie). It was an amazing run, but I wasn’t in a hurry to repeat it. And, I learned to respect Montana weather. Memories, that what these threads can do is to bring out memories. Our stove has a clear front for which I'm grateful, you can see when you need draft or not. I have a weather station out back with a wind gauge and that helps a lot too when adjusting the stove. It was 0 this morning when I got up and around so it's warming up. Negative 10 today with wind gusts 30 - 40 mph. Wind chills -20 to -30. 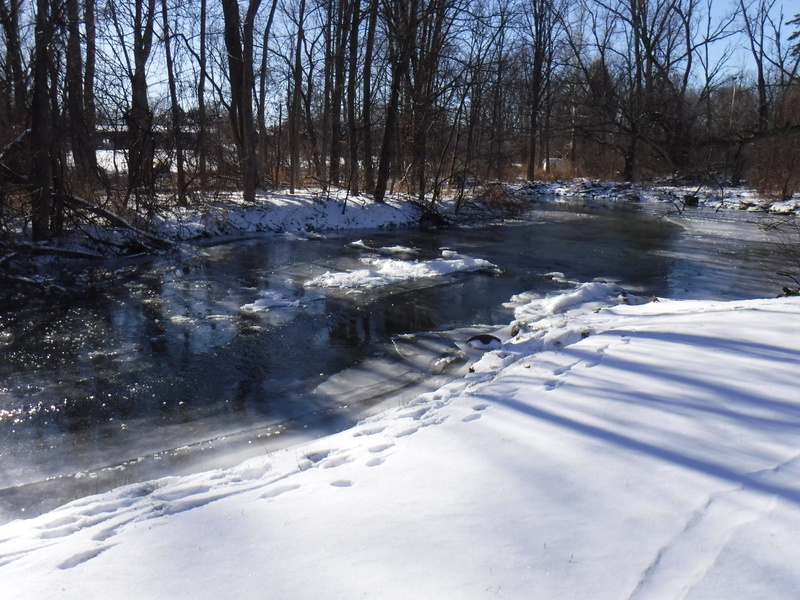 Plus we got around 7" of snow saturday drifting to 2-3 ft.
Had a chance yesterday to drive past a stretch of stream I fish-frozen over! Have not seen that in years. The temp at the time was 3 degrees. 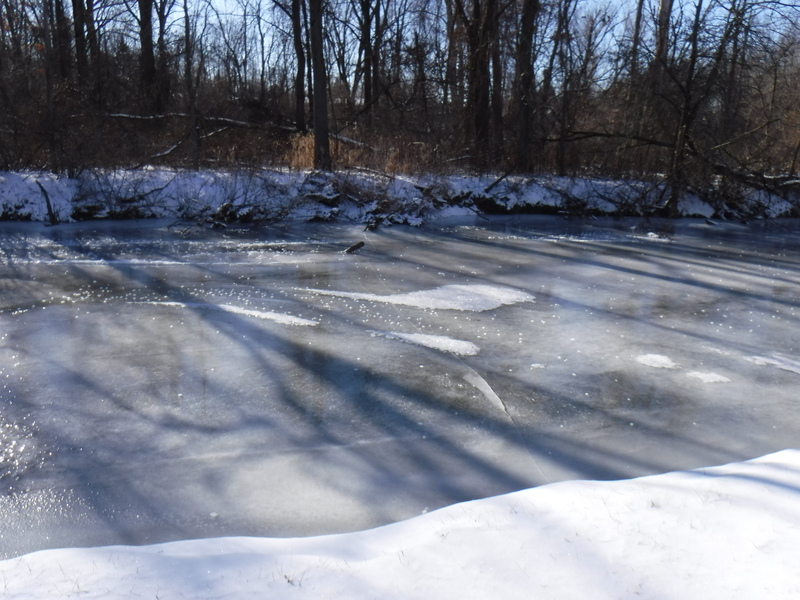 As I type this it's -1 outdoors, forecasters are saying a high of 37 on Wednesday and I'm planning on going trout fly fishing-not ice fishing! Hopefully the warmer temps will break the ice up some. Last edited by dennyk; 01-21-2019 at 12:38 PM. Here’s a freeze them up travel to the cabin kind of forecast. Getting expected weather is always reassuring. Why Can't I Tie a Simple, Standard Tie Anymore? Does anyone fly cast anymore?